If you’re looking to do some real-world environmental good, while having some virtual fun with your iPhone, iPhorest is worth a look. The $5 app from iPhactory lets you plant and grow a virtual tree on your iPhone or iPod touch; at the same time, iPhactory, in partnership with The Conservation Fund, will plant a real tree on your behalf. 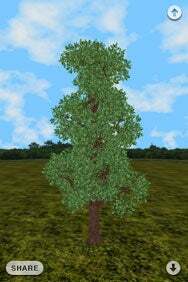 Tree Talk: iPhorest, which lets you grow a virtual tree on your iPhone or iPod touch is pretty basic. But when you buy the app, developer iPhactory and The Conservation Fund plant a tree on your behalf. The design and function of the app is very basic. You start with a seed, which you plant in the forest. iPhorest takes advantage of the motion sensitivity built into the iPhone, so you make a shoveling motion to dig a hole and plant the seed. You then shake the phone to trigger the rain and allow the seed to grow. After the rain clears and the sun comes out, the seed starts to grow into a sapling. After a few cycles of rain and sun, the tree eventually grows full size, and you can move on to plant another tree. Beyond planting and growing the tree, you are also able to zoom out from your forest until you get a Google Earth-like view of the planet from space. From here you can spin the globe and zoom in on certain areas. All iPhorest users are lit up on the globe, giving you a bird’s eye view of where the highest concentration of iPhorest users are located. There’s not much to the app beyond that. The real value to iPhorest lies in the live tree planted on your behalf. And that iPhorest icon on your home screen serves as a nice reminder of the environmentally conscious decision you made when you bought the app. iPhorest is compatible with any iPhone or iPod touch running the iPhone 2.2 software update.